I’m not the sort of person to go riding without the basics that will allow me to fix a flat tyre. Bit of a security blanket I suppose, even though Bromptons are ideally placed to be folded & carried home in any form of public transport, if the Brompton (or me) runs into trouble. My idea of the basics is a spare tube, tyre levers & pump. 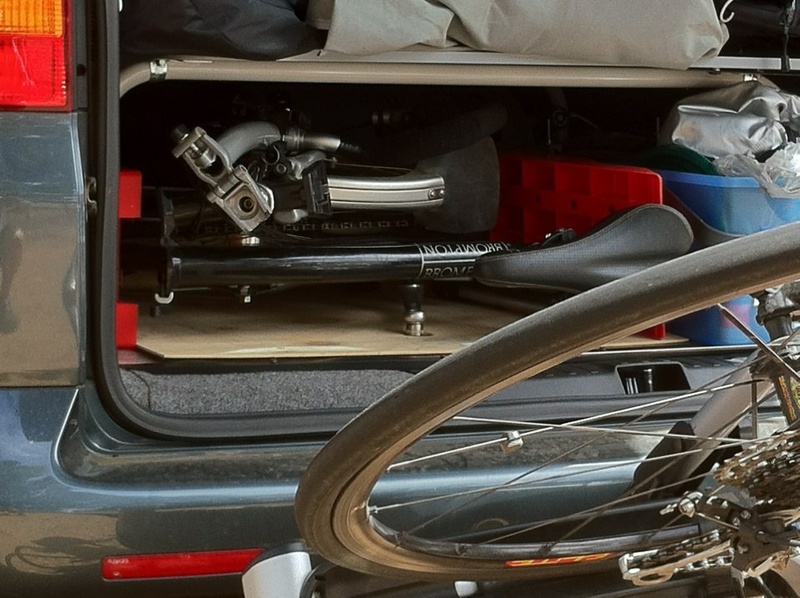 With most Bromptons having bolt-on wheels, a wheel spanner also needs to be included. The conundrum is where to carry everything & my C bag has been my place of storage (along with my water bottle). Now that my Bromptons are equipped with bidon cages, I decided to prepare for a “bag-less” ride & carry the tools on-board. 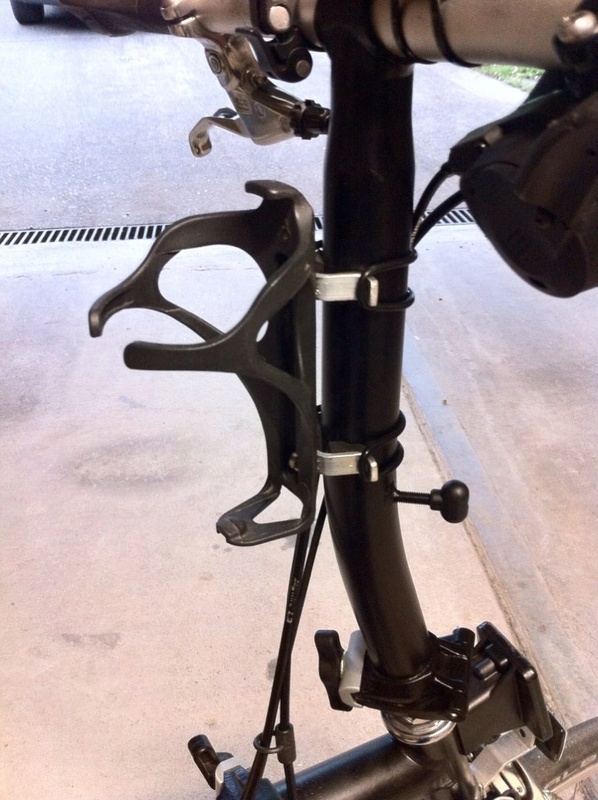 Brompton have produced a neat little toolkit that fits into the front section of the main frame but so far in the few months since release, I’ve been unable to obtain one – & now I believe they’ve been withdrawn to address a “quality issue”? My alternative is to rubber-band a cut-down wheel spanner, tyre levers & a small set of Allen keys together & wrap them in a set of disposable latex gloves. This fits cosily into the front section of the main frame. A spare Schwalbe SV4 tube (Presta valve type) fits into the rear section of the main frame. My method of insertion is to double the tube over, lightly twist it into a spiral & then wrap this with a piece of fibreglass insect screen mesh (about 45cm by 20cm). This mesh “tube” then slides into the frame with far less friction than the tube alone. The length of the mesh fills the tube space & is easy to pull out. I’ve always been wary of the Brompton pump staying in place & preferred to carry the pump in the C bag. Now with my Bromptons carrying their tools on-board, I’m trying the Brompton pump attached to the rear frame but for peace of mind, will probably soon use pumps housed within the seatpost tube on both Bromptons. Bromptons have many unique features but one that I don’t like is the lack of a bidon cage mount. Carrying water on a ride in this part of the world is pretty essential. I’m a fan of clipless pedals but on my folding bikes I sometimes want flat pedals & for travel/transport I want the bike compact. To me, the MKS removable pedals have filled the bill. 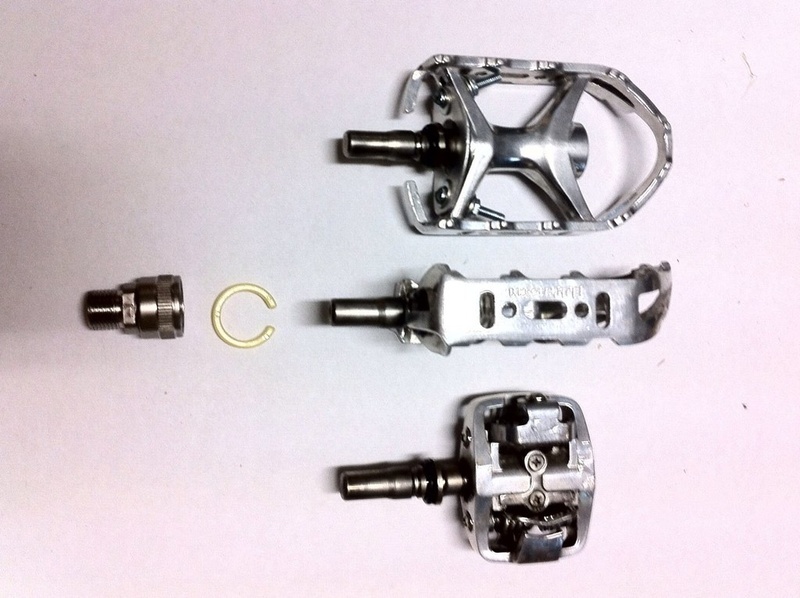 I have flat & clipless pedals that are the “pre-Superior” models (the Superior model uses an adapter that has an improved locking device but there isn’t a clipless model & the adapters aren’t compatible with the earlier adapters). For the clipless pedals, you need to use the MKS cleats for your shoes & these are compatible with both MKS & Shimano clipless pedals (ie the Shimano cleat is not compatible with the MKS clipless pedal). MKS provide a yellow nylon circlip for the non-Superior removable pedals, as a safety locking device for ensuring the pedals don’t unexpectedly disconnect from the adapters. To me they are a nuisance & slow down the removal of the pedals when necessary. 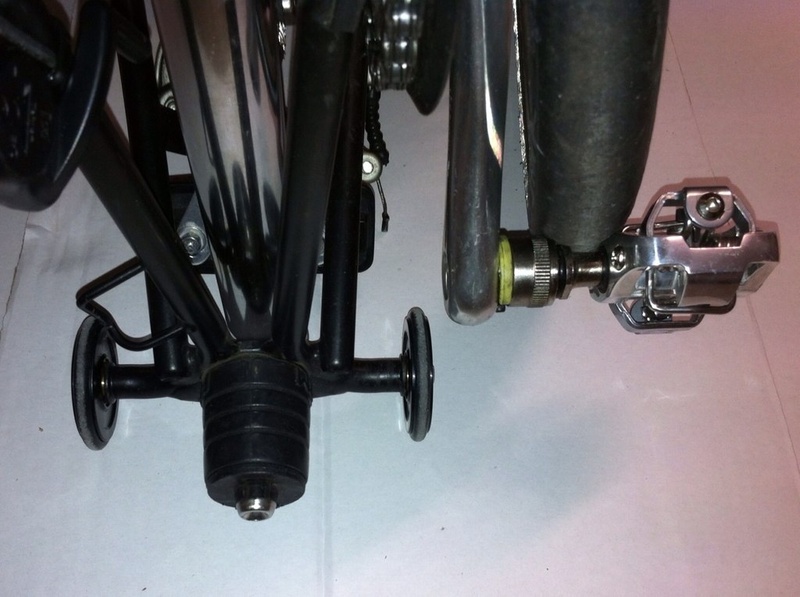 For the clipless pedals they hardly seem worthwhile because your shoe is locked to the pedal, but on the flat pedals a soft-soled trainer-type shoe is broader & may come in contact with the adapter (& possibly release the pedal). My solution was to fabricate an alloy plate to bolt to the adapter end of the flat pedal, ensuring that any shoe cannot come in contact with the adapter (see pic). When Ralph came along, I noticed that the front tyre can release the right side clipless pedal when Ralph is folded (it seems to be a factor of the widened frame & the Kojak tyres (see pic). As I don’t often have to remove the right side pedal, I’ve fitted the MKS circlip on that side. The usual position for the sensor would be on top of the chain stay arm of the rear frame, with the crank arm magnet on the end of the crank. 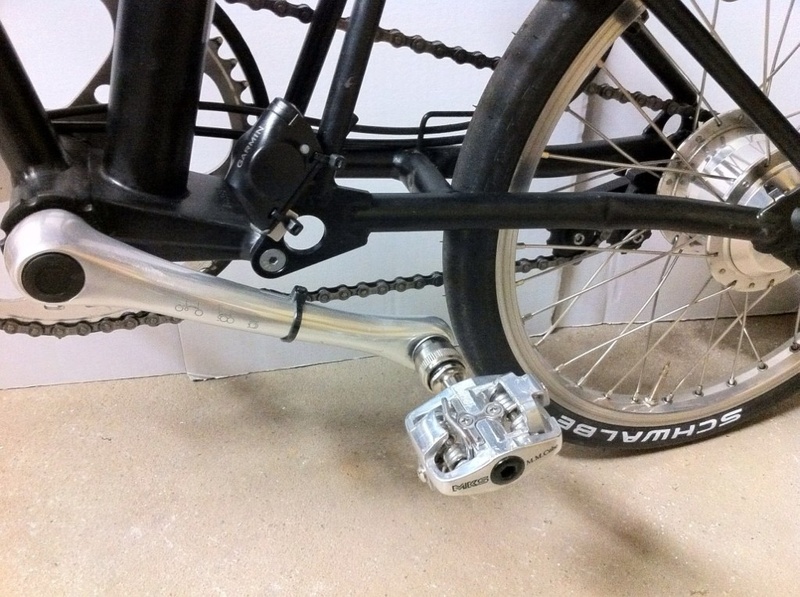 However, Ralph has a widened rear frame to fit the Alfine 11speed hub & there is no clearance for the crank arm magnet when Ralph is folded. I tried mounting the sensor on the vertical leg of the frame but discovered that the magnet then passes the sensor in the wrong plane (giving erratic/doubled cadence values). I nearly gave up but then tried cobbling up the sensor onto the frame joint (see pic) – & so far, it seems to be working! Our campervan, a VW T5 Transporter, has a Brompton-sized space under the bed. Here’s Robinson, tagging along on a trip to watch the cycle racing at the Australian RoadNats & the TDU.